Monday was a gorgeous day for photographing Fringed Orchids (Platanthera) in our nursery. Of the 14 species of Platanthera found in Georgia, eight are in cultivation in our nursery plus a number of hybrids with a confusing array of intermediate characteristics. Fortunately, Matt Richards, our Conservation Coordinator, happened by and brought me up to speed. Matt knows them all. 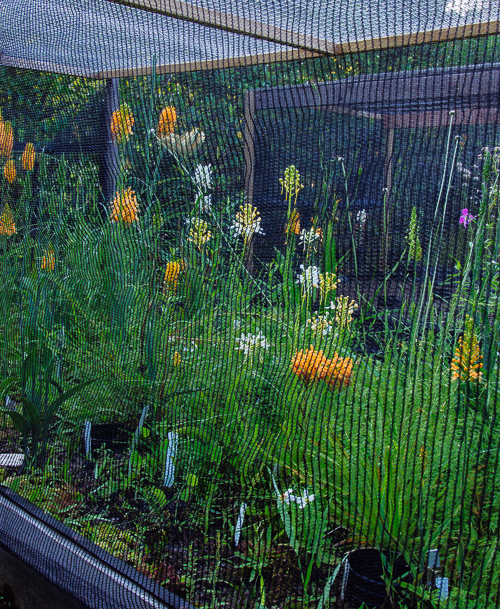 Not only does he conduct our conservation field work with Platanthera, he also propagates a number of them from seed in our lab and grows them in our nursery. He began by comparing the different species. 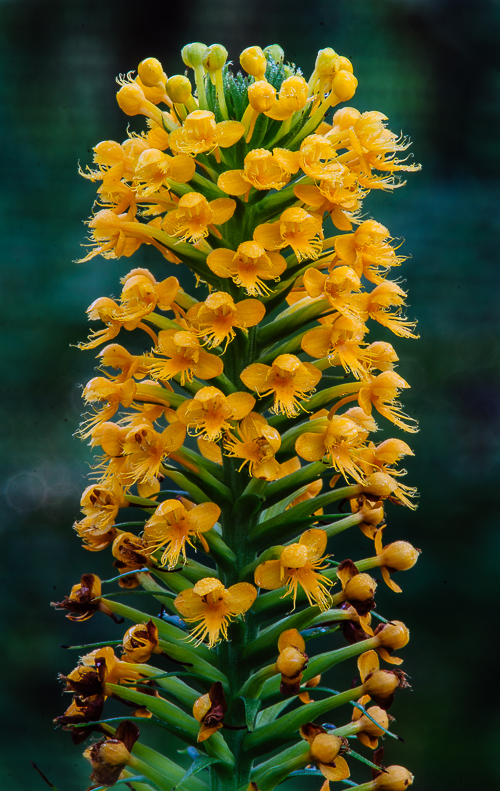 Crested Yellow Orchid (Platanthera cristata), pictured above, is one of a handful of yellow/orange Platanthera found in Georgia. In Georgia it is not as widespread or as common as Yellow Fringed Orchid (Platanthera ciliaris), but it has been found in at least 13 counties. Like P. ciliaris, it grows in moist open pinelands, wet meadows, roadsides and ditches. P. cristata starts flowering a bit before P. ciliaris, but there is some overlap in their flowering seasons. Where they occur together they often hybridize. Even from a distance, it is easy to distinguish between the two species. In overall dimensions and flower size, P. cristata is about half the size of P. ciliaris. The inflorescence is more cylindrical in shape. A closer comparison reveals that P. cristata's spur is about as long as the flower's lip, while P. ciliaris' spur is much longer than its lip. In P. cristata, the column forms a beak, or downward hook over the lip. The lateral petals are fringed over the entire margin, and not just the tips, as in P. ciliaris. Crested Yellow Orchid grows in wetlands outside of Georgia, too. Its range follows the east coast of the US from New Hampshire south to Florida and across the southeast to Texas. Platantheras are among our most beautiful native orchids and a fascinating component of our disappearing wetlands.